Most women are aware they need regular exercise to strengthen their heart and lungs and tone their bodies. Yet some women resist training for strength because of some common myths. Let’s debunk some of these common falsehoods about strength training. Myth: I don’t want to look like Dwayne Johnson in The Rock. Truth: It’s impossible for women to look like The Rock. Women don’t have the testosterone levels to build huge muscles, even if they lift heavy weights. 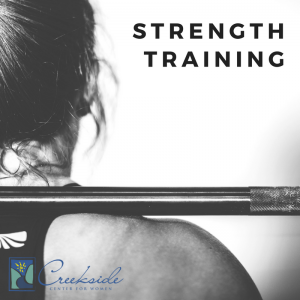 Strength training will increase your strength and define your muscles; it won’t bulk you up. Truth: While aerobics are important, strength training slows the declines in muscle mass, bone density, and strength that women experience as they age. In fact, strength training can even reverse those changes. Women might spend hours on a treadmill or walking a track and wonder why their bodies don’t change. Pilates and yoga are also excellent options to complement strength training, but they are not enough on their own. Myth: Strength training is for the young and vain. Truth: Inactivity is responsible for most of age related muscle loss. Using resistance in your workouts can reverse much of this muscle loss by increasing the size of your muscle fibers. It can also increase balance and coordination and help older people sleep better. Strength training can also help older adults live independently for longer as they have the strength to do everyday tasks. Myth: I’m good. I lift weights one day a week. Truth: You need three days a week of strength training to get results. If you’re beginning to strength train, start with two days, but aim to increase to three days a week. Your training sessions don’t need to be long, and 15-45 minutes is effective with the right exercises. Myth: I need to use the machine at the gym to get a real workout. Truth: The best exercises are exercises that use your whole body. If you sit on a machine to lift weights, you get good at sitting on a machine. Yet when in real life do you sit on a machine and push a weight with your legs? Instead, focus on exercises where you stand, lunge, bend and lift, using your body weight. You don’t have to go a gym at all to do effective strength training. You can do a workout at home with a set of dumbbells and a mat. If you haven’t exercised for a long time, speak to your doctor about concerns you have before creating an exercise plan. Call Creekside Center for Women at (479) 582-9268 to schedule an appointment.